The SDI Select 60 can use any Aero blasting machine nozzle or accessory to suit your application's need, and can be as gentle or aggressive as necessary - with blasting pressures ranging from 20 to 250 PSI - covering the widest range of applications in a single machine in the industry. 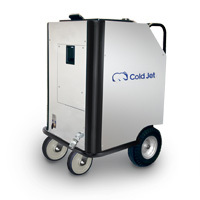 Cold Jet's patented feeder technology creates shaved dry ice on demand, regardless of input. Simply switch to full pellet cleaning to penetrate the most difficult, thick contaminants.